Omega Supreme is very old, possibly the oldest Autobot still functioning. His archaic but uncomplex design has endured remarkably well, but there are some known design flaws that must occasionally be corrected. One of the most common components to fail are the small cylindrical white (plastic) gears in his tank treads that enable him to walk in robot mode. Manufacturing (or finding) a replacement for these gears can take time. Here we have Ratchet and First Aid dilligently working on the lower half of Omega Supreme's tank mode amidst the rest of Omega's base construction. Warpath patrols Omega's tank treads in his stead. 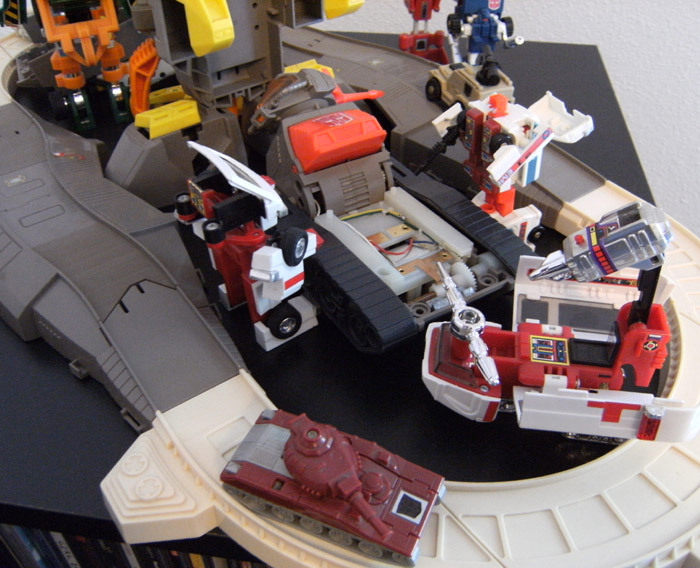 Featured: Omega Supreme, Ratchet, First Aid, Warpath. Background: Outback, Pipes, Powerglide, Hoist.